Egypt's interim president Adly Mansour has assigned prominent liberal economist Hazem El-Beblawi to top the administration that will be in charge of Egypt's upcoming transitional period. El-Beblawi, a former finance minister, was not the first choice of the parties involved in the political process sponsored by the Egyptian Armed Forces following the ouster last week of former president Mohamed Morsi. Most of the parties involved in the talks had preferred Mohamed ElBaradei for the premiership, who would have been appointed PM last Saturday were it not for the objections of the Salafist Nour Party. 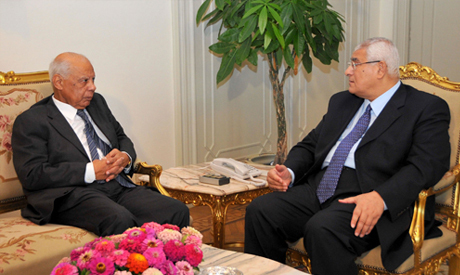 Elbaradei had been backed by the anti-Morsi Rebel campaign and other "revolutionary" youth groups and parties. Ziad Bahaa El-Din, liberal lawyer and co-founder of the Egyptian Social Democratic Party, was also floated for the position, but the ultra-conservative Nour Party also rejected his candidacy. Soon afterward, economist Samir Radwan, a former finance minister, was announced as a potential prime minister. It was El-Beblawi, however, who was soon after formally declared premier. The appointment came soon after interim president Mansour issued a new constitutional declaration granting him legislative authority. The constitutional declaration lays out the political roadmap that both Mansour and El-Beblawi will be expected to follow in the upcoming period. El-Beblawi, also a co-founder of the Egyptian Social Democratic Party, served as undersecretary-general at the UN between 1995 and 2000. He was minister of finance in Essam Sharaf's cabinet from July to October 2011 during Egypt's post-revolution army-administered transitional phase. The killing of innocent people by egypt military reminds me of my place kashmir where indian forces kill kashmiris and then lable them as terrorists.same has happened to egypt but alas here the killer is also muslim.i wonder what kind of muslims are in egypt that run the army and media outlets and trying to muzzle common egyptian voice.tragic??? Look how the socalled[Arab} muslim leaders are supporting oppression, they are running to Egypt now with BILLIONS to support a ARMY COUP. It's obvious to the world that these states are ruling there people with their Armies. They are american lackies and that is true since all their currencies are tied to the USDOLLAR.
" tragic events to unfold in egypt"
if the egyptian armforces killed over fifty of its people and wounded hundreds children, women and men indescriminately seriously,then the possibility of killing the president whom they kidnapped can easily happen. they feel they can do what they want, and soon will we see terrible future events.this is because they did not appologise, and to free dr. mursy will surely cause upheavels as the situation already is very volatile, and the army is becoming more hated by the egyption society. Liberal economist Hazem El-Beblawi appointed new Egyptian PM - RE: "tragic events to unfold in egypt"
The fact that no women and children were actually killed, and the photos the MB used were taken from the old Syria footage (which was noticed first by several International News agencies), along with statements by the residents, and video footage, really destroys the credibility of the MB versions of the Republican Guard incident. I hope this time it is official,and not just a rumor!Egypt is getting weak,with so many rumors,and nothing concrete on the ground! Don't be fooled by these unknow faces who have today become so called President or PM.